An art project: computer-generated parody of Mitt Romney's political tweets. Conceptual art. Because I like the concept of staying out of jail. J. Aycock. Painting the Internet. Leonardo 41, 2 (April 2008), pp. 112-113, MIT Press. Transactions section. This is the condensed and extended version of the tech report below. J. Aycock. Painting the Internet: A Different Kind of Warhol Worm, Technical Report 2006-834-27, Department of Computer Science, University of Calgary, 2006. Some of my pictures, and some unintended side effects of taking them. ...and anything else related to malicious software that I forgot to list. My security research lab, the Double Secret Security Lab, is co-located with the Programming Languages Lab in ICT 618A. J. Aycock. Retrogame Archeology: Exploring Old Computer Games. Springer, 2016. J. Aycock. Spyware and Adware. Advances in Information Security, volume 50, Springer-Verlag, 2011. If you're looking for the circles I mentioned in the Preface that indicate endnotes, they were quietly lopped off in production by the publisher. I apologize! The full errata list is here. D. Werden. 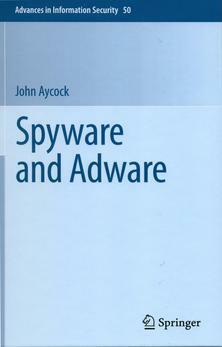 Review of Spyware and Adware by John Aycock, ACM SIGACT News 44, 1 (2013), pp. 17-19. J. Aycock. 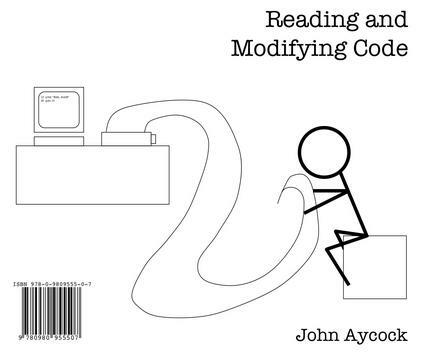 Reading and Modifying Code, 2008. The book is self-published. That means it's no good, right? J. Aycock. Computer Viruses and Malware. Advances in Information Security, volume 22, Springer-Verlag, 2006. A. Ortiz-Tapia. An Authentic Breakthrough, IEEE Distributed Systems Online 7, 12 (2006). M. Sanford. Computer viruses and malware by John Aycock, ACM SIGACT News 41, 1 (2010), pp. 44-47. J. Aycock and K. Biittner. Inspecting the Foundation of Mystery House. Journal of Contemporary Archaeology, 2019, to appear. J. Aycock, H. Wright, J. Hildebrandt, D. Kenny, N. Lefebvre, M. Lin, M. Mamaclay, S. Sayson, A. Stewart, and A. Yuen. Adapting the “Unessay” for Use in Computer Science. 24th Western Canadian Conference on Computing Education, to appear. J. Aycock. Interview with Glen Hartley re: Amnesia. Technical Report 2019-1109-01, Department of Computer Science, University of Calgary, 2019, to appear. J. Aycock and T. Copplestone. Entombed: An Archaeological Examination of an Atari 2600 Game. The Art, Science, and Engineering of Programming, 3, 2 (2019), Article 4, 33pp. J. Aycock. 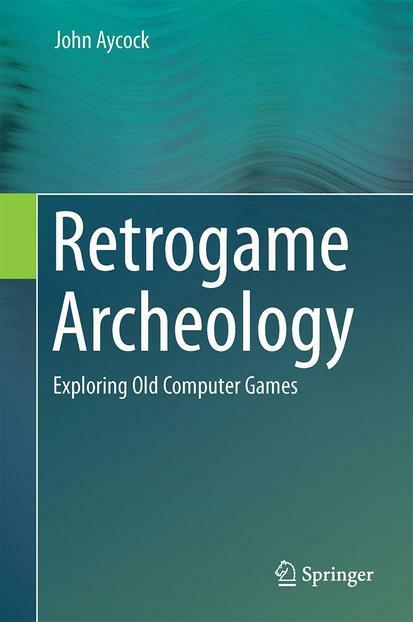 Finding the Invisible: An Experience-based Methodology for Selecting Retrogame Archaeology "Sites." Kinephanos, August 2018. J. Aycock, A. Groeneveldt, H. Kroepfl, and T. Copplestone. Exercises for Teaching Reverse Engineering. 23rd ACM Annual Conference on Innovation and Technology in Computer Science Education, 2018, pp. 188-193. J. Aycock. Stick to the Script: Lightweight Recording and Playback of Live Coding. 23rd ACM Annual Conference on Innovation and Technology in Computer Science Education, 2018, pp. 350-351. Tips, Techniques, and Courseware paper. J. Aycock. Game Studies at Scale: Towards Facilitating Exploration of Game Corpora. Loading... (journal of the Canadian Game Studies Association), 10, 17 (2017), pp. 93-111. Journal issue was published in early 2018. J. Aycock. Interview with Garry Marsh re: Beatle Quest. Technical Report 2017-1101-08, Department of Computer Science, University of Calgary, 2017. J. Aycock and A. Reinhard. Copy Protection in Jet Set Willy: Developing Methodology for Retrogame Archaeology. Internet Archaeology 45, 2017. J. Aycock. Interview with Steven Boykey Sidley re: Entombed. Technical Report 2016-1090-09, Department of Computer Science, University of Calgary, 2016. J. Aycock. Interview with Andy Remic re: Graphic Adventure Creator Games. Technical Report 2016-1089-08, Department of Computer Science, University of Calgary, 2016. B. Stephenson, M. James, N. Brooke, and J. Aycock. An Industrial Partnership Game Development Capstone Course. 17th Annual Conference on Information Technology Education, 2016, pp. 136-141. J. Aycock. Interview with Sean Ellis re: Graphic Adventure Creator. Technical Report 2016-1086-05, Department of Computer Science, University of Calgary, 2016. J. Aycock. Code Protection: When Abstinence is not an Option. 21st Western Canadian Conference on Computing Education, 2016, Article 12, pp. 12:1-12:5. J. Aycock. Stringlish: Improved English String Searching in Binary Files. Software: Practice & Experience 45, 11 (2015), pp. 1591-1595. Short communication. J. Aycock. Applied Computer History: Experience Teaching Systems Topics through Retrogames. 20th ACM Annual Conference on Innovation and Technology in Computer Science Education, 2015, pp. 105-110. J. Aycock, E. Pitout, and S. Storteboom. A Game Engine in Pure Python for CS1: Design, Experience, and Limits. 20th ACM Annual Conference on Innovation and Technology in Computer Science Education, 2015, pp. 93-98. Source. J. Aycock and D. M. N. de Castro. Permutation Steganography in FAT Filesystems. Transactions on Data Hiding and Multimedia Security X (LNCS 8948), Springer, 2015, pp. 92-105. S. Laing, M. E. Locasto, and J. Aycock. An Experience Report on Extracting and Viewing Memory Events via Wireshark. 8th USENIX Workshop on Offensive Technologies, 2014, 13pp. J. Aycock. Strung Out: Printable Strings in Atari 2600 Games. Technical Report 2014-1062-13, Department of Computer Science, University of Calgary, 2014. Errata. J. Aycock. Greetz from Academe: Will Research for Food. Virus Bulletin, June 2014, p. 22. Magazine column. J. Aycock. Greetz from Academe: Film at Eleven. Virus Bulletin, May 2014, p. 27. Magazine column. J. Aycock. Greetz from Academe: No Place to Hyde. Virus Bulletin, April 2014, p. 24. Magazine column. A. Mosunov, V. Sinha, H. Crawford, J. Aycock, D. M. N. de Castro, and R. Kumari. Assured Supraliminal Steganography in Computer Games. 14th International Workshop on Information Security Applications (WISA 2013), 2014, pp. 245-259. J. Aycock. Greetz from Academe: Censored. Virus Bulletin, March 2014, p. 29. Magazine column. J. Aycock. Greetz from Academe: Full Frontal. Virus Bulletin, February 2014, p. 30. Magazine column. J. Aycock. Greetz from Academe: Ringing in the New. Virus Bulletin, January 2014, pp. 16-17. Magazine column. J. Aycock. Greetz from Academe: Santa's Got a Gun. Virus Bulletin, December 2013, p. 19. Magazine column. J. Aycock. Greetz from Academe: Monkey vs. Python. Virus Bulletin, November 2013, p. 31. Magazine column. J. Aycock. Greetz from Academe: Counting Jedis. Virus Bulletin, October 2013, p. 22. Magazine column. D. M. N. de Castro and J. Aycock. Sample creation not considered harmful. 1st Workshop on Anti-malware Testing Research, 2013, pp. 35-40. J. Aycock. In Search of the E-Spot: Teaching a Turtle to Find an Ellipse. Mathematics in School 42, 5 (November 2013), pp. 37-38. J. Aycock. @TransforMitt. Leonardo 46, 5 (October 2013), pp. 482-483, MIT Press. Transactions section. J. Aycock. Greetz from Academe: On Motivation. Virus Bulletin, September 2013, p. 23. Magazine column. J. Aycock. Greetz from Academe: Masters of Their Own Domains. Virus Bulletin, August 2013, p. 23. Magazine column. J. Aycock. Greetz from Academe: Ethical Quandaries. Virus Bulletin, July 2013, pp. 22-23. Magazine column. J. Aycock and J. Sullins. Why "No Worse Off" is Worse Off. Cyber-security Research Ethics Dialog & Strategy Workshop, 2013, 4pp. J. Aycock. Greetz from Academe: Content-Agnostic Malware Protection. Virus Bulletin, June 2013, pp. 10-11. Magazine column. J. Aycock. A Collusion of Treasured Tweeds: The TransforMitt Compendium. Technical Report 2012-1029-12, Department of Computer Science, University of Calgary, 2012. C. Jarabek, D. Barrera, and J. Aycock. ThinAV: Truly Lightweight Mobile Cloud-based Anti-malware. 28th Annual Computer Security Applications Conference, 2012, pp. 209-218. J. Aycock, D. M. N. de Castro, M. E. Locasto, and C. Jarabek. Babel: A Secure Computer is a Polyglot. ACM Cloud Computing Security Workshop, 2012, pp. 43-54. E. Lin, J. Aycock, and M. Mannan. Lightweight Client-Side Methods for Detecting Email Forgery. 13th International Workshop on Information Security Applications, 2012, pp. 254-269. D. Williams-King, J. Denzinger, J. Aycock, and B. Stephenson. The Gold Standard: Automatically Generating Puzzle Game Levels. 8th AAAI Conference on Artificial Intelligence and Interactive Digital Entertainment, poster paper, 2012, pp. 191-196. J. Aycock, D. M. N. de Castro, M. E. Locasto, and C. Jarabek. Babel: A Secure Computer is a Polyglot. Technical Report 2012-1026-09, Department of Computer Science, University of Calgary, 2012. J. Aycock. Wild, Unsubstantiated Predictions: The Future of Computer and Network Security. Journal of Military and Strategic Studies 14, 2 (2012), 18pp. J. Aycock. μPython: Non-Majors Programming from the Very First Lecture. 17th ACM Annual Conference on Innovation and Technology in Computer Science Education, 2012, pp. 345-350. J. Aycock. What's in a Name... Generator? 21st Annual EICAR Conference, 2012, pp. 119-130. J. Aycock. A Bestiary of Overlooked Design Patterns. In Patterns, Programming and Everything, Springer, 2012, pp. 13-17. J. Aycock, E. Buchanan, S. Dexter, and D. Dittrich. Human Subjects, Agents, or Bots: Current Issues in Ethics and Computer Security Research. Panel paper, 2nd Workshop on Ethics in Computer Security Research (LNCS 7126), 2012, pp. 138-145. The workshop itself was held in 2011. J. Aycock. Stux in a Rut: Why Stuxnet is Boring. Virus Bulletin, September 2011, pp. 14-17. Copyright is held by Virus Bulletin Ltd., but is made available on this site for personal use free of charge by permission of Virus Bulletin. N. Nygren, J. Denzinger, B. Stephenson, and J. Aycock. User-preference-based automated level generation for platform games. IEEE Symposium on Computational Intelligence and Games, 2011, pp. 55-62. E. Buchanan, J. Aycock, S. Dexter, D. Dittrich, and E. Hvizdak. Computer Science Security Research and Human Subjects: Emerging Considerations for Research Ethics Boards, Journal of Empirical Research on Human Research Ethics 6, 2 (2011), pp. 71-83. E. Lin, S. Greenberg, E. Trotter, D. Ma, and J. Aycock. Does Domain Highlighting Help People Identify Phishing Sites? ACM CHI 2011, pp. 2075-2084. J. Aycock. The Ear of Sauron. Hakin9 5, 11 (2010), pp. 12-13. Errata. J. Aycock, A. Somayaji, and J. Sullins. The Ethics of Coexistence: Can I Learn to Stop Worrying and Love the Logic Bomb? Technical Report 2010-986-35, Department of Computer Science, University of Calgary, 2010. E. Lin, S. Greenberg, E. Trotter, D. Ma, and J. Aycock. Does Domain Highlighting Help People Identify Phishing Sites?, Technical Report 2010-978-27, Department of Computer Science, University of Calgary, 2010. E. Lin, D. M. N. de Castro, M. Wang, and J. Aycock. SPoIM: A Close Look at Pollution Attacks in P2P Live Streaming. 18th IEEE International Workshop on Quality of Service, 2010, 9pp. D. Williams-King, J. Aycock, and D. M. N. de Castro. Enbug: When Debuggers Go Bad. ACM ITiCSE 2010, pp. 28-32. D. M. N. de Castro, E. Lin, J. Aycock, and M. Wang. Typhoid Adware. 19th Annual EICAR Conference, 2010, pp. 13-30. J. Aycock and J. Sullins. Ethical Proactive Threat Research. Workshop on Ethics in Computer Security Research (LNCS 6054), Springer, 2010, pp. 231-239. J. Aycock and A. Borsotti. Early Action in an Earley Parser. Acta Informatica 46, 8 (December 2009), pp. 549-559. N. Friess, H. Crawford, and J. Aycock. A Multi-Agent Approach to Testing Anti-Spam Software. 1st International Workshop on Defence against Spam in Electronic Communication, 2009, pp. 38-42. J. Aycock, J. M. Gutiérrez Cárdenas, and D. M. N. de Castro. Code Obfuscation using Pseudo-Random Number Generators. 1st International Workshop on Software Security Process, 2009, pp. 418-423. H. Crawford and J. Aycock. Supraliminal Audio Steganography: Audio Files Tricking Audiophiles. 11th International Workshop on Information Hiding (LNCS 5806), Springer, 2009, pp. 1-14. M. McDonald, J. Ong, J. Aycock, H. Crawford, and N. Friess. A Lightweight Drive-by Download Simulator, 18th Annual EICAR Conference, 2009, pp. 141-152. N. Friess and J. Aycock. A Kosher Source of Ham, MIT Spam Conference, 2009, 9pp. J. Nielson, D. M. N. de Castro, and J. Aycock. Image Spam – ASCII to the Rescue! Malware '08, short paper, pp. 65-68. J. Aycock and A. Aycock. Why I Love/Hate Wikipedia: Reflections upon (not quite) subjugated knowledges, Journal of the Scholarship of Teaching and Learning 8, 2 (May 2008), pp. 92-101. H. Crawford and J. Aycock. Kwyjibo: Automatic Domain Name Generation, Software: Practice & Experience 38, 14 (2008), pp. 1561-1567. M. Nielsen, D. Bertram, S. Pun, J. Aycock, and N. Friess. Global-scale Anti-spam Testing in Your Own Back Yard, Fifth Conference on Email and Anti-Spam (CEAS 2008), 8pp. J. Aycock, H. Crawford, and R. deGraaf. Spamulator: The Internet on a Laptop, ACM ITiCSE 2008, pp. 142-147. J. Aycock and A. Maurushat. "Good" Worms and Human Rights, ACM SIGCAS Computers & Society 38, 1 (March 2008), pp. 28-39. Definitive version via ACM. (This is an extended version of TR 2006-846-39 below.) Errata. J. Szabo, J. Aycock, R. Acton, J. Denzinger. The Tale of the Weather Worm, ACM SAC 2008, pp. 2097-2102. S. Pun, E. Parsons, M. Nielsen, D. Ma, and J. Aycock. Predictions about the Prediction Scam. Virus Bulletin (Spam Supplement), February 2008, p. S2. Copyright is held by Virus Bulletin Ltd., but is made available on this site for personal use free of charge by permission of Virus Bulletin. R. Vogt, J. Aycock, and M. Jacobson, Jr. Quorum Sensing and Self-Stopping Worms. 5th ACM Workshop on Recurring Malcode (WORM 2007), pp. 16-22. J. Aycock and A. Maurushat. Future Threats. 17th Virus Bulletin International Conference, 2007, pp. 275-281. Copyright is held by Virus Bulletin Ltd., but is made available on this site for personal use free of charge by permission of Virus Bulletin. J. Aycock. A Design for an Anti-Spear-Phishing System. 17th Virus Bulletin International Conference, reserve paper, 2007, pp. 290-293. Copyright is held by Virus Bulletin Ltd., but is made available on this site for personal use free of charge by permission of Virus Bulletin. N. Friess and J. Aycock. Black Market Botnets, Technical Report 2007-873-25, Department of Computer Science, University of Calgary, 2007. R. H. Hemmingsen, J. Aycock, and M. Jacobson, Jr. Spam, Phishing, and the Looming Challenge of Big Botnets. EU Spam Symposium, 2007, also as Technical Report 2007-865-17, Department of Computer Science, University of Calgary. Errata. Reprinted in Chapter 9 of Botnets: A Cyber Threat, S. Puneet, ed., Icfai University Press, 2008, pp. 156-170. J. Aycock. Covert Zombie Ops. Virus Bulletin, May 2007, pp. 11-13. Copyright is held by Virus Bulletin Ltd., but is made available on this site for personal use free of charge by permission of Virus Bulletin. J. Szabo, J. Aycock, R. Acton, J. Denzinger. The Tale of the Weather Worm, Technical Report 2007-858-10, Department of Computer Science, University of Calgary, 2007. R. Acton, N. Friess, and J. Aycock. Inverse Geolocation: Worms with a Sense of Direction. Malware '07, pp. 487-493. A. Fink, J. Denzinger, and J. Aycock. Extracting NPC behavior from Computer Games using Computer Vision and Machine Learning Techniques. IEEE Symposium on Computational Intelligence and Games, 2007, pp. 24-31. R. Vogt, J. Aycock, and M. Jacobson, Jr. Army of Botnets, 14th Annual Network and Distributed System Security Symposium, 2007, pp. 111-123. (This is an extended version of TR 2006-840-33 below.) Reprinted in Chapter 10 of Botnets: A Cyber Threat, S. Puneet, ed., Icfai University Press, 2008, pp. 171-199. J. Aycock and A. Maurushat. "Good" Worms and Human Rights, Technical Report 2006-846-39, Department of Computer Science, University of Calgary, 2006. R. Vogt and J. Aycock. Attack of the 50 Foot Botnet, Technical Report 2006-840-33, Department of Computer Science, University of Calgary, 2006. J. Aycock. Teaching Spam and Spyware at the University of C@1g4ry, Third Conference on Email and Anti-Spam (CEAS 2006), short paper, pp. 137-141. J. Aycock and J. Uhl. Choice in the Classroom. ACM SIGCSE Bulletin 37, 4 (December 2005), pp. 84-88. R. deGraaf, J. Aycock, and M. Jacobson, Jr. Better Port Knocking with Strong Authentication. ACSAC 2005, pp. 409-418. N. Friess, R. Vogt, and J. Aycock. Timing is Everything. Computers & Security 24, 8 (November 2005), pp. 599-603. A. Hirt and J. Aycock. Anonymous and Malicious. 15th Virus Bulletin International Conference, October 2005, pp. 2-8. Copyright is held by Virus Bulletin Ltd., but is made available on this site for personal use free of charge by permission of Virus Bulletin. J. Aycock, R. deGraaf, and M. Jacobson, Jr. Anti-Disassembly using Cryptographic Hash Functions, Technical Report 2005-793-24, Department of Computer Science, University of Calgary, 2005. Errata. J. Aycock and M. Zastre. An Exceptional Programming Language. 2005 International Conference on Programming Languages and Compilers, H. R. Arabnia, ed., ISBN 1-932415-75-0, pp. 137-141. J. Aycock. Your Computer is Toast. Virus Bulletin, invited comment, June 2005, p. 2. Copyright is held by Virus Bulletin Ltd., but is made available on this site for personal use free of charge by permission of Virus Bulletin. References and additional information. J. Aycock and S. Bertazzon. Using Malware to Improve Software Quality and Security. 14th Annual EICAR Conference, 2005, pp. 239-252. Reprinted in Chapter 12 of Malware: An Introduction, R. K. J. Bandamutha, ed., Icfai University Press, 2006, pp. 205-222. Errata. J. Aycock and K. Barker. Viruses 101. ACM SIGCSE 2005, pp. 152-156. J. Aycock. Extending Old Compiler Tools with Meta-Tools. 2004 International Conference on Software Engineering Research and Practice, H. R. Arabnia and H. Reza, eds., ISBN 1-932415-29-7, pp. 841-845. K. Wilson and J. Aycock. NEST: NEtwork Server Tool. 5th International Conference on Internet Computing, poster, 2004, p. 700. Full paper is available as Technical Report 2004-746-11, Department of Computer Science, University of Calgary, 2004. J. Aycock and K. Barker. Creating a Secure Computer Virus Laboratory. 13th Annual EICAR Conference, 2004, 13pp. J. Aycock. The ART of Compiler Construction Projects. ACM SIGPlan Notices 38, 12 (December 2003), pp. 28-32. J. Aycock. A Brief History of Just-in-Time. ACM Computing Surveys 35, 2 (June 2003), pp. 97-113. J. Aycock. OpenBSD in the Classroom, Daemon News, June 2003. J. Aycock. A Program Execution Model Based on Generative Dynamic Grammars. IASTED International Conference on Computer Science and Technology (CST 2003), pp. 411-416. J. Aycock, D. Pereira, and G. Jodoin. UCPy: Reverse-Engineering Python. PyCon DC 2003, 9pp. D. Pereira and J. Aycock. Dynamic Region Inference, Technical Report 2002-709-12, Department of Computer Science, University of Calgary, 2002. D. Pereira and J. Aycock. Instruction Set Architecture of Mamba, a New Virtual Machine for Python. Technical Report 2002-706-09, Department of Computer Science, University of Calgary, 2002. J. Aycock and R. N. Horspool. Practical Earley Parsing. The Computer Journal 10, 6 (2002), pp. 620-630. J. Aycock. AGATE: Unifying Languages and Operating Systems. Technical Report 2002-703-06, Department of Computer Science, University of Calgary, 2002. J. Aycock. The Design and Implementation of SPARK, a Toolkit for Implementing Domain-Specific Languages. Journal of Computing and Information Technology CIT (Special Issue on Domain-Specific Languages) 10, 1 (2002), pp. 55-66. J. Aycock. A Brief History of Just-in-Time. Technical Report 2001-689-12, Department of Computer Science, University of Calgary, 2001. J. Aycock. Why Bison is Becoming Extinct. ACM Crossroads 7.5 (Mid Summer 2001). J. Aycock, N. Horspool, J. Janousek, and B. Melichar. Even Faster Generalized LR Parsing. Acta Informatica 37, 8 (2001), pp. 633-651. J. Aycock and N. Horspool. Schrödinger's Token. Software – Practice & Experience 31, 8 (2001), pp. 803-814. J. Aycock and N. Horspool. Directly-Executable Earley Parsing. CC 2001 – 10th International Conference on Compiler Construction (LNCS 2027) , Springer-Verlag, 2001, pp. 229-243. J. Aycock and N. Horspool. Simple Generation of Static Single-Assignment Form. CC 2000 – 9th International Conference on Compiler Construction (LNCS 1781) , Springer-Verlag, 2000, pp. 110-124. R. N. Horspool and J. Aycock. Analysis of Equation Structure Using Least Cost Parsing. IWPT 2000 (6th International Workshop on Parsing Technologies), poster, pp. 307-308. J. Aycock. Aggressive Type Inference. Proceedings of the 8th International Python Conference, 2000, pp. 11-20. J. Aycock and M. Levy. An Architecture for Easy Web Page Updating. ACM Crossroads 6.2 (Winter 1999), pp. 15-18. J. Aycock and N. Horspool. Faster Generalized LR Parsing. CC '99 – 8th International Conference on Compiler Construction (LNCS 1575), Springer-Verlag, 1999, pp. 32-46. J. Aycock. Compiling Little Languages in Python. Proceedings of the 7th International Python Conference, 1998, pp. 69-77. Source. J. Aycock. Converting Python Virtual Machine Code to C. Proceedings of the 7th International Python Conference, 1998, pp. 43-50. J. Aycock. MBL: A Language for Teaching Compiler Construction. Technical Report 1995-574-26, Department of Computer Science, University of Calgary, 1995. Sawdust is wood, but sod dust is dirt. Building a subway is under construction. A conductor's baton is a band stimulant. Rabbit in aspic is hare gel. How are bacteria different from cafeteria? I can get cheese from either one. Geology essays are edited using rock paper scissors. Waltzing around carrying bread products is something done in abundance. Excess sar can be shoveled into a sarcasm. A baker showed his love for his girlfriend by painstakingly making her cinnamon rolls shaped like classic automobiles, thus inventing car bun dating. The café was so dirty that they served soil lattes. There was an upcoming Shakespeare test in the English class, and a student asked "What sonnet?" Ancient writing can just rune your whole day. A member of a submarine crew brought aboard a garden gnome; he thought that would give them luck on their arduous trek. But the gnome wouldn't fit anyplace, and everything had to be reorganized on the boat to accommodate it. It was a sub space agnomealy. The chiropractic college's fall message was not "Welcome back, students!" but "Welcome, back students!" A dog with a wooden leg has a faux paw. The two of them were chosen the day prior to help get potatoes ready before the big dinner. The pre-pared were prepared by the pre-paired. The sheriff, seeing his posse arriving, said "my throng is riding up." The life of a tree: one day you're feeling chipper, the next day you're in one. Computer scientists make soup with Boolean cubes. For a writer, a typo is disaster: no character ever died gloriously in a hail of mullets. Their house's electricity suddenly came back on, delivering a kick to the family joules. A quiet rhinoplasty is Dolby nose reduction. All the birds in ancient Rome were the same color. Rome was famous for its aqua ducks. The web page's design was tasteful, as if created by an elite squad of drunken monkeys. Cats right themselves; books don't. A stiff competitor is a starch-enemy. Pinocchio was happy; he was a-wood-chipper. The accident in his beloved "green" car was like a punch to the solar Lexus. Purple is when you yank on a cat's tail. A letter opener is what makes an "o" into a "c."
Nothing provides instant clarity and reflection like pressing the "send" key. Slowly, the farm equipment turned, and its headlight illuminated a small bed. It was a cot in the tractor beam. Does a program that works with TIFF files have to take arguments? No wonder I'm so tired – I'm in the human race! That explains why people keep handing me cups of Gatorade. Old mail in your webmail account is cobwebmail. Make sure to cross your eyes and dot your "T"s.
My antisocial networking website is wildly successful: no users yet. I read a book on approximation algorithms. It had about six chapters. An expensive, but well-lit, French apartment is both sunny and cher. Children can see up your nostrils at all times. Never attempt a shellsort until the turtles have stopped moving. If you give a man a fish, you'll feed him for a day. Teach a man to fish, and he makes fish sticks and starts dressing all nautical and saying things like "Har! Y'ever been to sea?" Most comments I receive about my web page are to do with the crossed-out titles up at the top. This may mean that most people don't read beyond line two of my web page. However, on the off chance that these hold some entertainment value, I've compiled a list of previous titles.